Brain Awareness Week (BAW) is a international effort started by the Dana Alliance for Brain Initiatives and the Society for Neuroscience to promote the public and personal benefits of brain research. 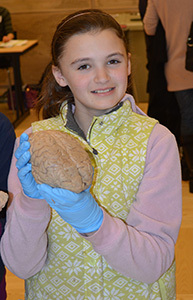 On March 4, 2014, approximately 650 students in grades 4-12 attended the University of Washington Brain Awareness Week Open House in the ballrooms of the Husky Union Building. This year the open house was supported by the Pacific Cascade Chapter of the Society for Neuroscience and the Center for Sensorimotor Neural Engineering. As in past years, students started the Open House with a multimedia "Brain Assembly" with Dr. Eric Chudler. The students learned about neurotransmission, compared the brains of different animals and played with some visual illusions. Students then visited exhibits set up by University of Washington departments and other organizations. The Neurobiology and Behavior Community Outreach Program had exhibits to test the senses and materials to build neuron models. The DO-IT program, UW Department of Otolaryngology, Institute for Learning and Brain Sciences, Northwest Association for Biomedical Research, Department of Biology, Center for Sensorimotor Neural Engineering, Hope Heart Institute, Seattle Hydrocephalus Support Group, UW Dept. of Biological Structure, UW Department of Radiology, Institute for Learning and Brain Sciences, Pacific Science Center, UW Neurobiology Club, Northwest Association for Biomedical Research, Edmonds-Woodway High School, UW Bloedel Center, and Sowing the Seeds of Neuroscience all provided exhibits. My students experienced real science and how it is done...something I can only talk about. They also had a broad range of experiences that fit all their learning styles. This is one of the best field trips I have taken my kids to! The students are engaged and gain an interest in neuroscience and science in general. They get first-hand experience of a college campus, college students, grad-students, professors. These are all important in helping kids think about their futures and in being motivated to succeed. The students came away with more questions too! Everything related to brain safety was very important for the students to see! Copyright © 1996-2014, Eric H. Chudler All Rights Reserved.